You guys, I have queued SO MANY THINGS lately. This is primarily because, over on the Ravelry forums, I belong to a group that is currently engaging in a massive Secret Santa. But instead of picking a name out of a hat, people are gifting knitters in the community who have had a special affect on them this year. The recipients get earburned by the organizer, and they respond with patterns or things they want for the holidays! I've gifted a few people- some friends, excellent knitters, people who have helped me work through some knitting issues this year... It's great! 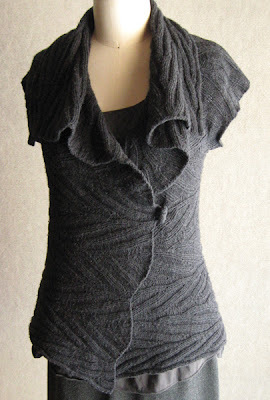 Adam's Ribs Cap Sleeve Wrap by Carol Sunday is gorgeous and would be amazing in a linen or cotton, but also would look SO cute layered over a long sleeve tee! 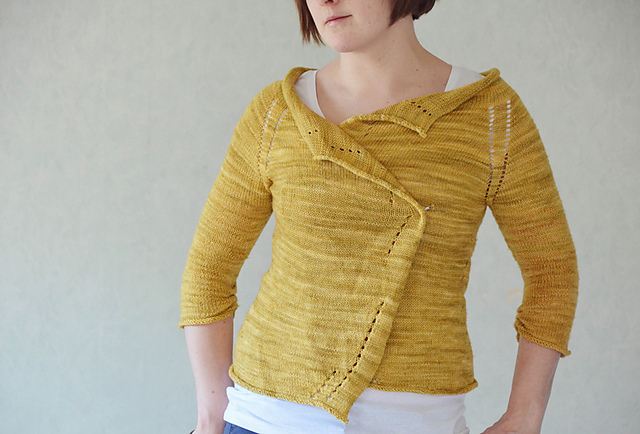 Kyllene, by Kirsten Jensen, which makes me feel like I don't have the skills to make it. Remember when I showed you millamelli's eclectic electric? Same pattern! And those are just a few! PS:Don't forget to enter December's giveaway! I love the look of the Adam's Rib wrap!